Adults and their tots will have fun exploring, discovering, and learning on the first Thursday of the month in the Museum’s Discovery Center. Spend quality time with your tot, while each of you makes new friends. A different topic and craft will be featured each month. Registration is not required and admission is free. Participants will enjoy light refreshments. The program begins promptly at 9:30 a.m. with the program portion lasting approximately thirty minutes followed by crafts, snacks, and time to explore the Museum. 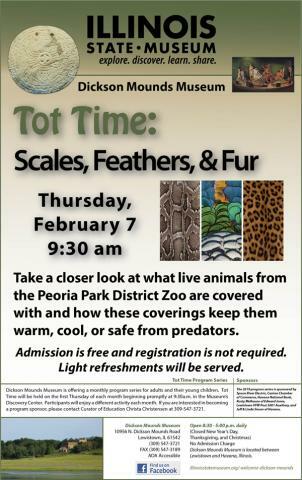 On February 7th, the Peoria Park District Zoo will present Scales, Feathers, & Fur featuring live animals. Whether its scales, feathers or fur, take a closer look at what the animals are covered with and how these coverings keep the animals warm, cool, or safe from predators. The 2019 Tot Time program series is sponsored by Spoon River Electric’s Operation Round-up grant, Canton Chamber of Commerce, Havana National Bank, Lewistown VFW Post 5001 Auxiliary, Rusty Melhouse of Edward Jones, and Jeff and Linda Sisson of Havana. The Tot Time program series continuously seeks sponsors. Please contact Curator of Education Christa Christensen at 309-547-3721 for more information.